The Panorama now gets on even better with Logic. Nektar Technology has announced that its Panorama controllers now offer tighter integration with Apple's Logic Pro X, and also its predecessor, Logic 9. 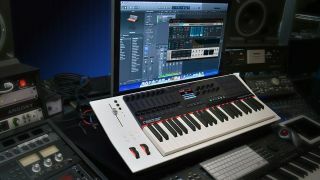 In fact, the company says that it now has "the most comprehensive Logic controller on the market," and one that puts you in charge of the mixer, insert plugins, instruments and project navigation. Mixer control was already on offer, but the Instrument and Transport modes are new. In Instrument mode, all of Logic's instruments are automatically mapped to Panorama's controls (including the new Alchemy synth that was added in Logic Pro 10.2) while AU instruments can also be mapped via the supplied editor. Transport mode, meanwhile, is designed to enable mouse-free project navigation. The deeper Logic integration has been added to the Panorama P1, P4 and P6 controllers, and is a free update for existing users. You can find out more on the Nektar website.